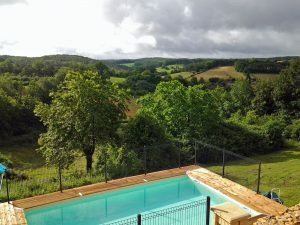 Very comfortable, well equipped self catering accommodation, a newly converted (2015) gite with en-suite facilities and luxury pool situated to the north of the Perigord Noir, the heart of the Dordogne. 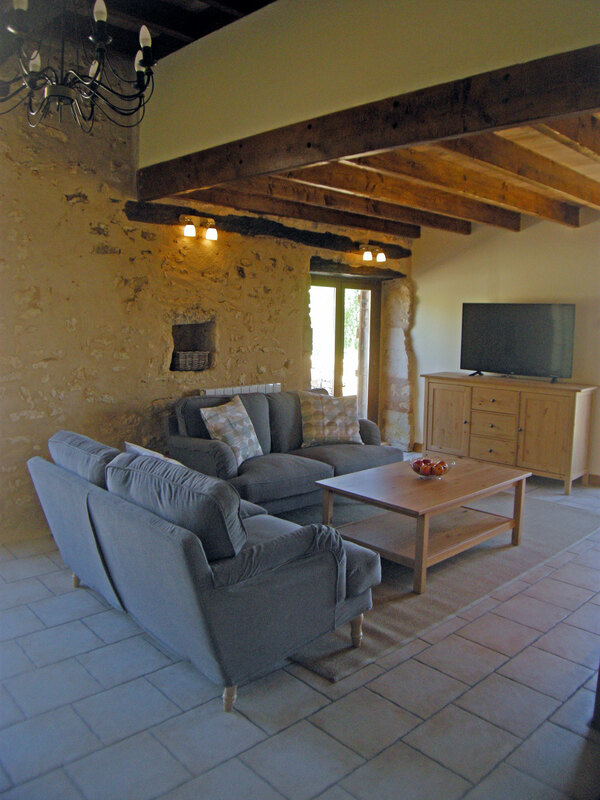 The 200 year old barn, has been beautifully converted into a private 2 bedroom gite sleeping 5 (max) people, With open plan living space and a well equipped kitchen area. The private, heated 8×5 metre pool sits on the side of a hill with stunning views across the valley towards the village of St Laurent des Batons. 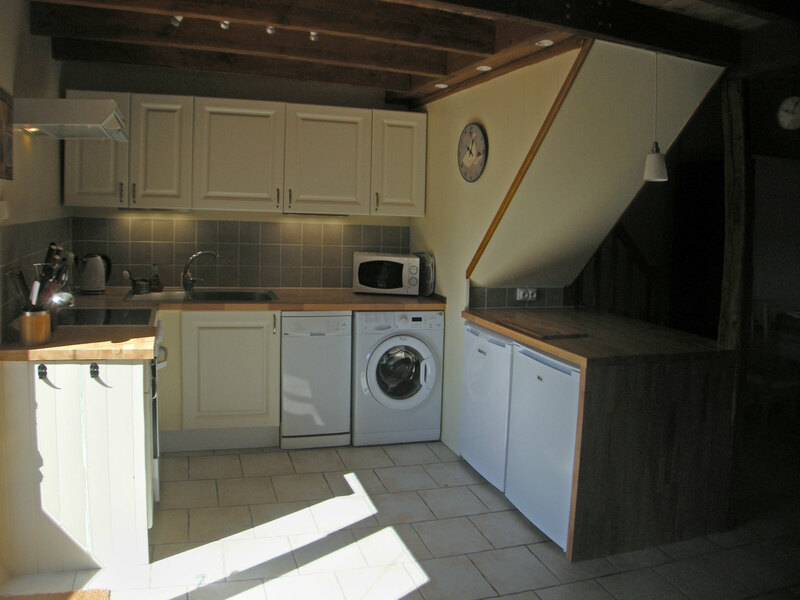 The property is minutes away from both the Dordogne and Vézère valleys. 10km south of Vergt, and 24km north of Le Bugue with their numerous tourist attractions, weekly markets and selection of supermarkets. 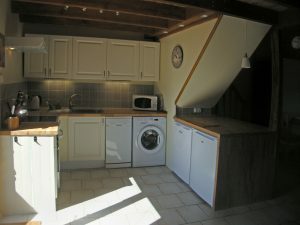 As people who enjoy good food and cooking, we have provided everything we would hope to find in a brand new fully equipped fitted kitchen – full size cooker, microwave, fridge and seperate freezer, dishwasher, food processor, cook’s knives, serving dishes, kettle, teapot and all cooking utensils. There is also a washing machine, iron and ironing board. Modern 49” flat screen HD TV, satellite TV (with all English free to air channels), and DVD. We have an up to 20MB broadband connection with WiFi and a good 3G mobile signal. To minimise the amount of luggage you need to bring, especially for those flying, all bed linen and towels are provided and included in the price, including pool towels. For 2 week bookings, a fresh set of linen and towels are provided for the second week. Please note, we do not provide bed linen for the child’s travel cot. There is a mobile air conditioning unit in the upstairs bedroom of the gite. Fans are also provided in each bedroom. Smoking: in the interest of safety and the comfort of fellow/subsequent guests, we kindly request that you refrain from smoking inside the gite. A fire extinguisher and fire blanket are provided in the kitchen and smoke alarms are fitted. The heated, private pool for sole use by our guests, is 8x5m and 1.4m deep with steps providing easy access and is in full sunshine for most of the day with views over the valley and the village of St Laurent des Batons. It conforms with all French pool security regulations and, for added security and peace of mind, the pool is surrounded by decking and set in a fully fenced pool area. Our pool is a traditional chlorinated pool, checked and maintained daily, to ensure bather comfort and heated to ensure you enjoy it in most seasons. We also have a hot tub suitable for 4 people. While the pool and hot tub are fenced to comply with French legislation, your safety remains your own responsibility and children must be supervised by an adult at all times. All pool maintenance is undertaken by Dean. You’re on holiday – there’s nothing for you to do unless you really want to. There are stunning views over the surrounding countryside from the gite, terrace and pool. The newly established garden around the barn is for sole use by gite guests, with some trees offering shade. Some garden maintenance (yes, grass cutting and watering) will be necessary during your stay – but we’ll endeavour to do this while you are out and about. We are surrounded by open fields and woods – excellent for an evening stroll. There is plenty of garden furniture and barbecue equipment. Sun loungers, umbrellas, table and chairs are available by the pool. 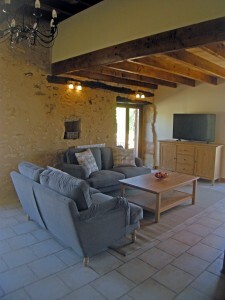 The gite has a large terrace with charcoal barbecue, wooden table and chairs. The gite has an excellent 3G mobile signal, and Wi-Fi access. There are loads of books, covering a huge range of tastes – so even if you’re not using a Kindle – you can travel light. During the season, all arrivals are on Saturday. We may be able to be a little more flexible outside of high season – just ask. Dean and Debra, the British owners, live discreetly on site. You can book your holiday using our convenient form, check our prices and availability or you can find more information here.